The Antediluvian world is filled with harrowing entities, the enemies of all mortals. They wait in the shadows, plotting. They rule the unexplored reaches. To them, all are prey. Other beings, less extraordinary, but just as sinister, lurk on every city street, in backwater villages, and even in the temples. A Hero must be forever on guard while adventuring in the known world. An encyclopedia of mythic creatures ready to challenge players and populate adventures. Over 150 culturally diverse adversaries from the known world of Atlantis. Expanded adversary creation rules allowing Game Masters to challenge players with new and original creations. Commentary and insight into the creatures by the notable heroes of the antediluvian world. 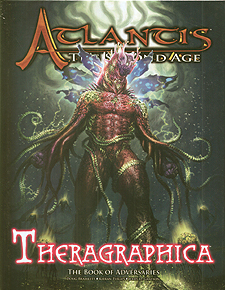 Requires the Atlantis: The Second Age core book.